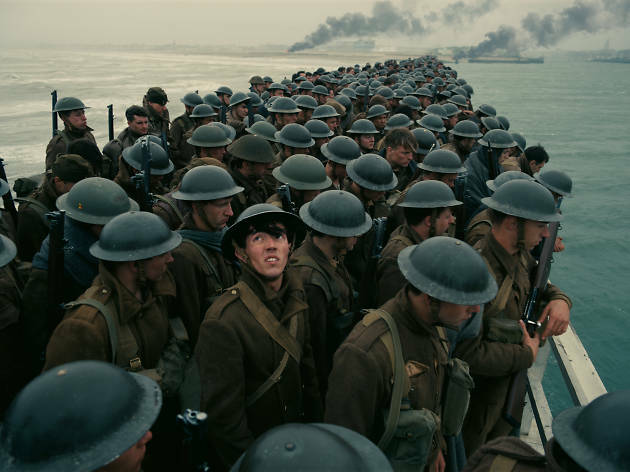 Christopher Nolan’s somber tribute makes a distant war feel uncomfortably present. You might already know how the May 1940 evacuation of France’s Dunkirk turned out: More than 300,000 troops, mainly British ones, escaped from the beach while being bombarded by the Nazis. But the power of Christopher Nolan’s harrowing, unusual dramatic re-creation is that it tries—with real success—not to make any of this feel like just another war movie. Instead there’s an uneasy sense of a bloody, strange event unfolding in that unknowable way that those on the ground might have experienced it. Dunkirk is awe-inspiring and alienating, as it should be. 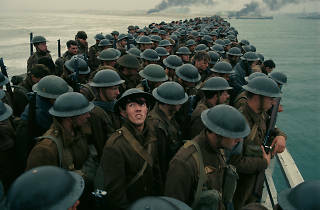 At less than two hours (brief for the director of the epic Dark Knight films), with dialogue kept to a bare minimum, Dunkirk provides a short, sharp dose of the oddness and horror of war, dropping us right into the fray. It’s a staggering feat of immersive terror, blessed with such knockout cinematography that the movie demands to be seen on as massive a screen as possible (Nolan has shot the film in two large-frame formats, IMAX and 65mm). It looks, feels and sounds like a nightmare, balancing naked suffering (drowning, shooting, crashing, burning) with a hint of unearthliness: Nazi propaganda leaflets spookily dropping from the sky; strange foam washing up on the sand; dislocating aerial shots of sea meeting land. Nolan divides events into three interlocking chapters, offering a trio of perspectives. One segment, “The Mole, One Week,” takes place on the harbor wall from which thousands were rescued and where we see a commander (Kenneth Branagh) trying to make sense of unfolding disaster. There’s “The Sea, One Day,” in which a civilian sailor (Bridge of Spies’ Mark Rylance) sets off from the English south coast. And then there’s “The Air, One Hour,” in which RAF pilot Farrier (Tom Hardy) engages in dogfights with the Luftwaffe. There are other characters—most notably pop star Harry Styles as a beach soldier and Cillian Murphy as a disturbed warrior rescued from the hull of a sinking warship. Yet as much as these familiar faces give us something to grab on to, this is a film without heroes or a straightforward story. The action is the attraction. If that means some of the film feels a little distant and chilly, it’s in the admirable service of avoiding simplistic drama or easy sentiment. Winston Churchill called Dunkirk a miracle. The newspapers tagged it a triumph. But Nolan resists any punch-the-air celebration. Hans Zimmer’s orchestral score scrapes away at you throughout, piling unease on unease before flirting with Edward Elgar’s war-remembrance anthem “Nimrod” and backing off, as if embarrassed. Tough questions are posed about the government: A survivor asks a pilot back home, “Where the hell were you?” We hear Churchill’s famous “We shall fight on the beaches” speech, but the words come from the mouth of a dazed soldier, not the prime minister. There’s no glory here, just survival.